US equity indexes closed moderately weak, sp -6pts @ 2168. The two leaders - Trans/R2K, settled lower by -0.9% and -0.2% respectively. 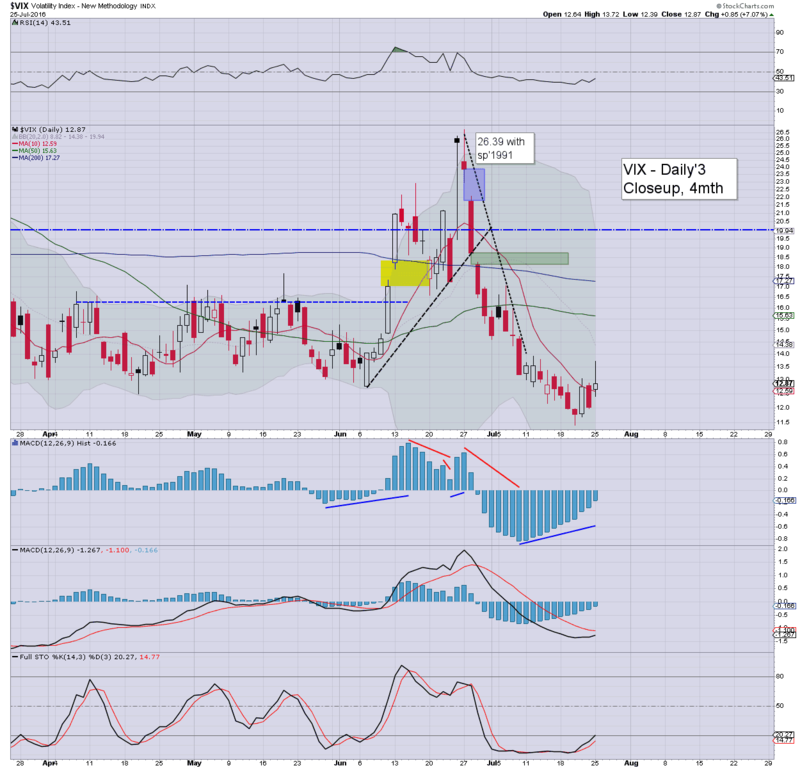 VIX settled +7.1% @ 12.87. Near term outlook still threatens an 'FOMC mini washout' to the breakout level of the sp'2130s, but broadly... the 2200s look inevitable. So, some weakness to begin the last week of July, but still, it was nothing of any significance. It is notable that we've traded in a mere 20pt (0.9%) range across the past 8 days. 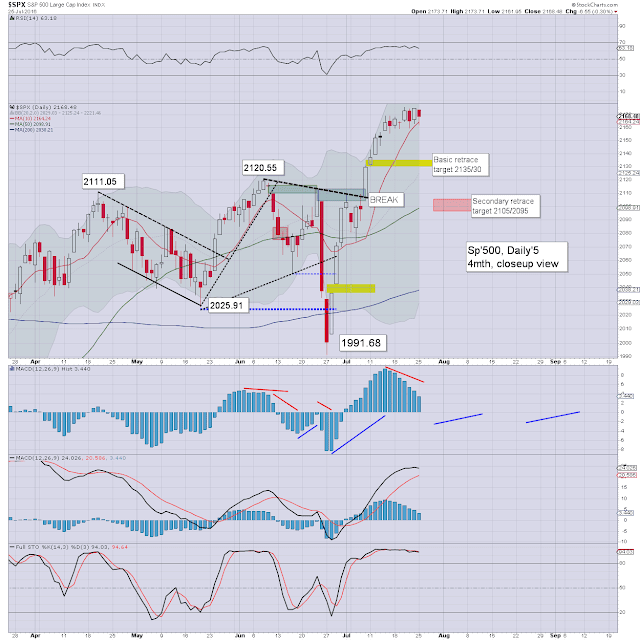 Its arguably just 'consolidation in time', before the next push into the 2200s. There are still four trading days left of July, but my attention is already switching to how the monthly candles will settle. As things are, a July close above the monthly 10MA (currently 2056) is now a certainty, and it is extremely probable that the sp'500 will settle net higher for a fifth consecutive month - the best run since June 2014. 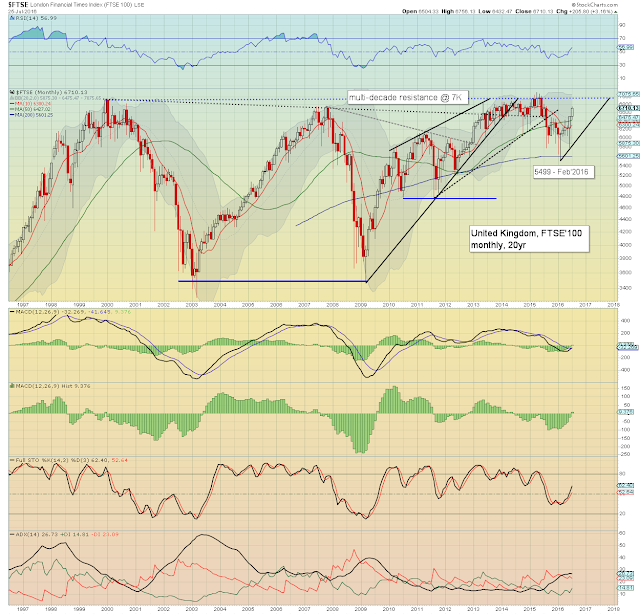 A monthly close >7K would be hugely significant, and bode for similar strength in the US. The BoE will likely cut rates by 25bps in August, and possibly even spool up the printers. UK savers will once again be (justifiably) dismayed with the Canadian.... Mr Carney. *I'll cover the world markets in depth this coming weekend.